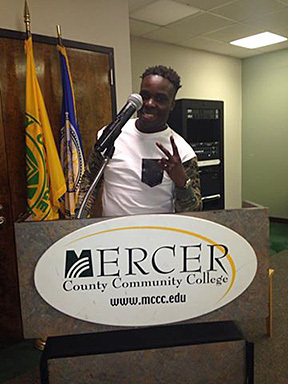 Trenton, N.J. -- It was a star studded evening at Mercer County Community College's Trenton Campus on October 28, one that is likely to have students talking for months to come. 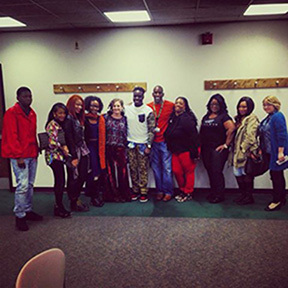 Celebrity stylist Stefon Allen (aka Zoe Dupree) brought his "Styling School" to the campus's Kerney Hall. More than 20 students and community guests attended the two-hour workshop, where they learned how to network, make a brand and break into the world of fashion. According to Terrence Carter, advisor for the JKC Student Activities Board, the event generated a lot of excitement. “Anytime you have someone of this magnitude and connections coming to our campus, it’s a big deal,” he said. 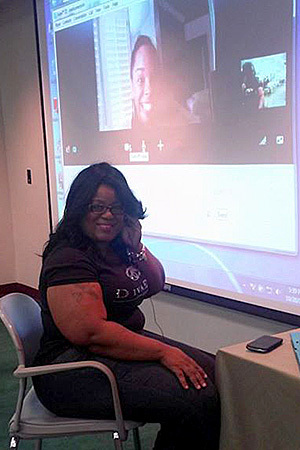 The workshop included a special guest appearance via Skype by actress Cherie Johnson from the hit TV shows “Punky Brewster” and “Family Matters." She spoke to the crowd about her start as a child actor, her clothing line and her upcoming movie roles. Carter says that a few students got to talk with Johnson and were delighted with her down-to-earth responses. One student, Alice Young, told Johnson about her make-up business and Johnson promptly asked Young to do her make-up for her upcoming movie. The evening concluded on several high notes. Dupree asked everyone to check under their chairs. Those who found cards taped there got a special gift. Student Angelica Ayala, who makes her own jewelry, was offered the opportunity to display her jewelry on one of Dupree's celebrity clients. And Alice Young, already psyched to do make-up for Johson, will also do make-up for one of Dupree's clients. Also attending the festivite event were Precious Sullivan (Philly Fashionista) and NFL free agent, safety Antoine Hall. Zoe Dupree at the microphone. advisor Terrence Carter (right of Dupree).